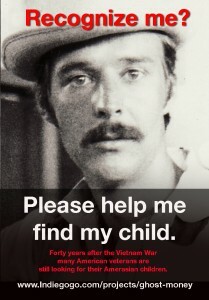 Ex-GI & Local Filmmaker Larry Johnson documents search for lost love and Amerasian child in Vietnam. Mar - 20 | By: sourappleproductions | one comment. Portland, Oregon – Lawrence (Larry) Johnson, known for award-winning documentary films STUFF and HAND GAME, has told many stories through his films, but has been haunted for over 40 years by his own: When he was in the Army in Saigon in the 1970s, he fell in love with a Vietnamese woman named Candy, and when they split at the end of the war, she may have been pregnant with his child. aftermath of the Vietnam War and into the lives of Amerasian children wanting to reunite with their fathers, knowing all the while that time may be running out. but it has broadened to become the story of the thousands of children who were born during this conflict and have lived with abandonment — and sometimes even persecution — ever since. During the war, Johnson worked in Saigon in the early 1970s as an entertainer for Command Military Touring Shows, playing drums and arranging entertainment for the troops. While living there, he shot hours of super 8 film depicting life in Saigon. That rare footage will be used in GHOST MONEY, along with his own brand of brush-drawn animation, to tell the story of Johnson’s war years, and to contrast with scenes of modern Vietnam. 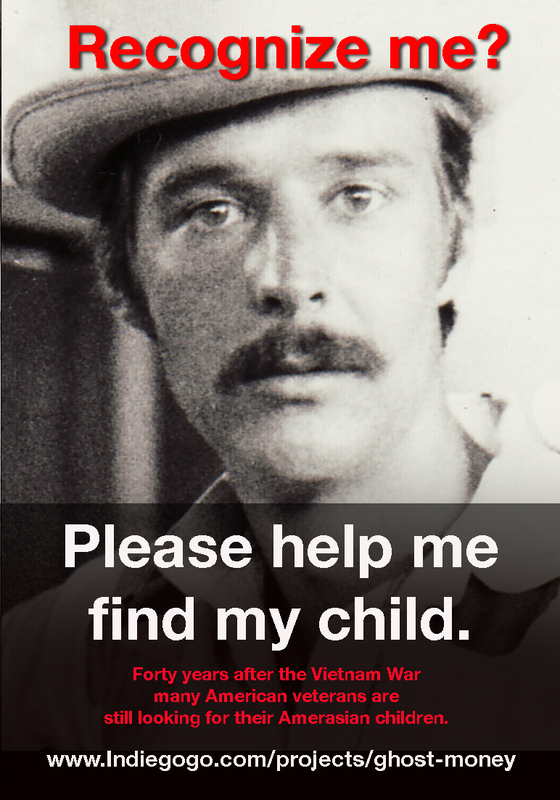 To search for Candy, Johnson visited many of the “haunts” from his past and even appeared on a popular Vietnamese TV show that helps people reunite with lost loved ones. Johnson’s fundraising campaign will run for 30 days, and will be found here . More information and excerpts of GHOST MONEY are available at www.ghostmoneythefilm.com. Larry Johnson is available for interviews and can provide footage from his film for broadcast. forgotten. My search for Candy, the Vietnamese woman I had loved, led me to the surprising revelation that I may have fathered a child with her. But this wasn’t the only shock in store for me. Forty years later, I learned that the war still haunts that nation. In the fields and towns our soldiers drenched with Agent Orange, babies are still being born with birth defects. Unexploded ordnance still kills dozens per year. And thousands of Amerasian children born of relationships like mine and Candy’s are living lives shadowed by abandonment and persecution. My pursuit of just one woman and one child ends up taking me through the streets, bars, hospitals, and homes of modern Vietnam, and into the American communities of Vietnamese refugees torn from their homeland during the war. And as weeks of searching have turned into months, I am now keenly aware that for Amerasian children who want to reunite with their aging fathers, time is running out. Saigon but spent most of my time in cafes and streets of the city, documenting everything I saw, both beautiful and horrifying. GHOST MONEY will also tell the story of how I fell in love with Lien, aka “Candy,” who was captivating, somewhat unstable, and like many Vietnamese, believed she was possessed by a ghost. I will bring this turbulent love story to life through brush-drawn animation based on the many drawings I did during the time we were together. fathers they have never met. Families torn apart by loss and relocation. My hope is that my story will inspire other veterans like me to reconnect with their past and help to heal some of these wounds. 2012, Johnson received the prestigious Fellowship Award in Media Arts from the Regional Arts and Culture Council, honoring artists in the Portland metropolitan area who are the strongest representatives of the range and diversity of art in the Northwest. Currently he is director of animation on My American Waistline, a web series and working on his next personal documentary feature, Ghost Money, about his girlfriend in Vietnam 1972.